WASHINGTON, DC, September 25, 2018 (ENS) – Cost won out over safety, as the Trump administration Monday repealed an oil train regulation regarding the type of brakes the trains must have. 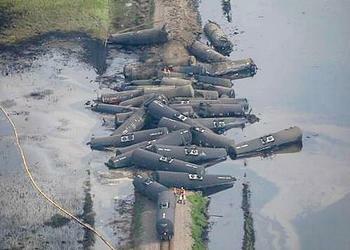 Critics say the change will increase the risk posed by oil train derailments. On June 22, a train carrying Canadian crude oil derailed in northwestern Iowa, releasing roughly 230,000 gallons of oil into a flooded river. Since 2014 West Virginia, Virginia, Illinois, and Oregon have all experienced oil train derailments in which burning and leaking oil tank cars either spilled oil in a river or close to rivers. Nevertheless, the U.S. Department of Transportation’s Pipeline and Hazardous Materials Safety Administration, PHMSA, Monday finalized amendments to the Hazardous Materials Regulations which remove the Obama-era requirement to operate using electronically controlled pneumatic braking systems. The PHMSA’s action is based on a Congressional requirement to conduct an updated Regulatory Impact Analysis, RIA. The Fixing America’s Surface Transportation Act, called the FAST Act, required further analysis of the electronically controlled pneumatic brake requirements, including physical testing, to improve general knowledge and understanding of how much more effective ECP brakes are in comparison to other brake systems. It also required the Department of Transport, DOT, to determine whether the electronically controlled pneumatic brake requirements are justified based on the expected costs and benefits. The updated RIA incorporated new findings from testing this type of brakes conducted by the Federal Railroad Administration, and reviewed by the National Academy of Sciences. It incorporated recommendations from the U.S. Government Accountability Office, and updated costs and benefits of the electronically controlled pneumatic brake provision based on current economic conditions. The department’s analysis shows that the expected costs of requiring electronically controlled pneumatic brakes would be “significantly higher than the expected benefits” of the requirement, and therefore the FAST Act required DOT to repeal the lectronically controlled pneumatic brake requirement. The law still allows certain High Hazard Flammable Unit Trains to operate using electronically controlled pneumatic braking systems. Washington Governor Jay Inslee lost no time in making his objections known. “Today’s news signifies a reckless disregard for the life and property of all who live or work along the rail tracks that transport volatile Bakken crude oil,” said Governor Inslee. The Trump administration late last year dealt another blow to efforts to improve oil train safety when it issued a decision to withdraw sleep/fatigue rules for railroad employees. For more details, the Department’s Final Rule announcing its decision, along with the final updated RIA that responds to comments received, are online at: http://www.regulations.gov in Docket Number PHMSA-2017-0102.